Neal Asbury is the chief executive of The Legacy Companies. He was the 2008 recipient of the coveted United States National Champion Exporter of the Year Award. He has published more than 100 articles on global trade issues, and been quoted in The New York Times, Wall Street Journal, and LeMonde, and has appeared on network television nationally and internationally. He is also the host of “Truth For America,” a nationally-syndicated radio talk show that attracts a Who’s Who of political and business figures. On March 15, 2010, Peter Miller, President of PMA Literary & Film Management, Inc., announced the sale of the world English rights to Conscientious Equity: An American Entrepreneur’s Solutions to the World’s Greatest Problems by Neal Asbury to Palgrave Macmillan. Miller negotiated the sale with Laurie Harting, Executive Editor. The book will be published in hardcover in October 2010. In Conscientious Equity, Asbury argues that moving away from intransigent political ideologies and toward a world driven by international commerce allows us to address and in fact solve economic instability, the destruction of the environment, crushing poverty, and crippling corruption all over the planet. 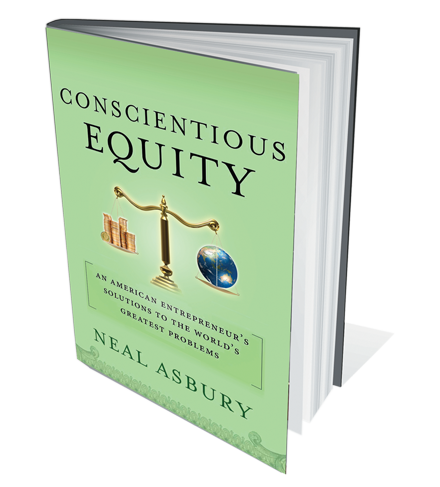 Neal Asbury has been working as an international entrepreneur for nearly three decades, and he knows perhaps better than anyone alive, how much of a boon the principles of Conscientious Equity could be to both America and all citizens of the world. In this book, he lays out a plan for making Conscientious Equity happen, addressing all of the roadblocks and opportunities that lay before us. Neal Asbury’s plan of action is far more then theories and assumptions prepared for print. It is a proposition based on the first hand experience of a seasoned entrepreneur working nationally and abroad. Since the very beginning, Neal Asbury has used first hand observation to harness knowledge of trade and bring profitability to several export companies. He is certain that the application of the principles which brought him commercial prosperity will do the same for the nation as a whole. What is more, rather then use what he knows solely to further his success as an exporter Neal Asbury takes every possible opportunity to share what he knows with others. Neal Asbury is the chief executive of The Legacy Companies. He was the 2008 recipient of the coveted United States National Champion Exporter of the Year Award. He has published more than 100 articles on issues including free trade, free enterprise, economic recovery, and government policies. He has also been quoted in The New York Times, Wall Street Journal, and LeMonde, and has appeared on network television nationally and internationally. Each week, Asbury hosts “The Neal Asbury Show,” a radio talk show that attracts a Who’s Who of political and business figures. Produced by Atlantic Radio Network, it is syndicated around the country, including such stations as 1500 AM (the #1 talk radio station in Washington DC); KDOW-1220 (San Francisco/San Jose); WZAB-AM 880 The Biz (Miami); WGKA-920 (Atlanta); KSEV (Houston); and KKOL-1300 (Seattle). “The Neal Asbury Show” is affiliated with Bloomberg Radio and CNBC and broadcasts from Coral Gables, Florida as well as Capitol Hill. Mr. Asbury is a founding faculty member of Export University (a collaboration between the District Export Council and the U.S. Department of Commerce). He is the chairman of the Export University National Oversight Committee. He is vice chairman of the District Export Council National Steering Committee and chairman of the Florida District Export Council, appointed to serve by the U.S. Secretary of Commerce. He is a member of the prestigious International Policy Committee of the U.S. Chamber of Commerce in Washington. In addition, Mr. Asbury has a close working relationship with the Department of Commerce, the Small Business Administration, and the Export-Import Bank of the United States.